"3 Series Electronic Locking Rack Handle" - Delivery: The RCI (3525PRX) Electronic Rack Handle with Proximity Reader is factory-ordered, please allow 3-5 working days' lead time. It can be combined with any access control device for a basic self-contained electronic access solution. Alternatively, the electronic rack handle can provide access control to networked rack control and monitoring systems for addressable remote access control over the internet. Integrated lock sensors provide local LED indication plus generate output signals for remote access monitoring. - Local monitoring with multi-color LED indicator. 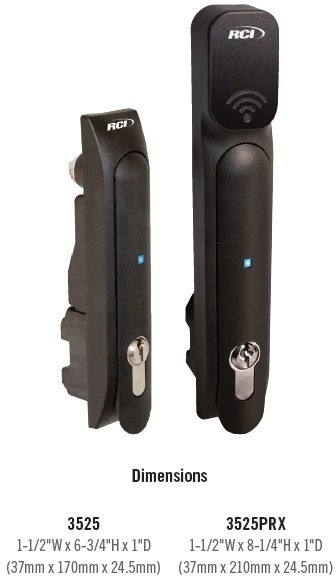 - Remote lock and unlock control. - Single or multi-point locking. - Low power, gear motor driven mechanism. - Momentary or continuous lock actuation. - High security DIN lock for mechanical key override. - Non-handed - for use with right and left handed doors. - Wire harness and hardware kit included. - Includes 3 keys (keyed alike). - Activated via any third party control system (Access Control). - Housing, handle and mounting bracket are made of black, glass-filled nylon. - Shaft and rotation limiter are made of die-cast zinc with a bright sealer finishing. - 125kHz HID® reader recognizes existing employee RFID prox cards. - Wiegand output can be connected to a standalone controller or an existing networked access control system for remote control, monitoring and reporting.